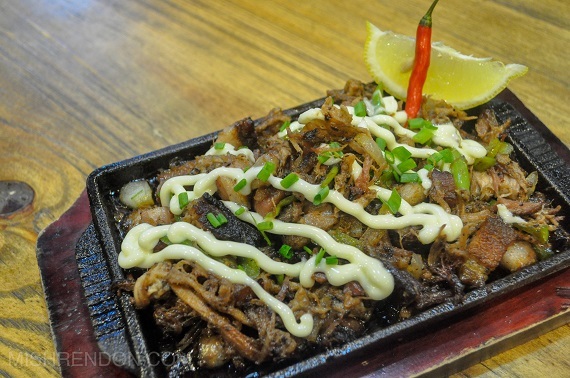 Kapitolyo never fails to surprise everyone with unique food experiences that would surely make people satisfied. Every place I have visited there has given me nothing but a loaded belly and an awesome time. Anyway, the last place I've been to started out as a small barbecue place along East Capitol Drive. Now, it has turned into a legit barbecue place offering smoked meats, among others. 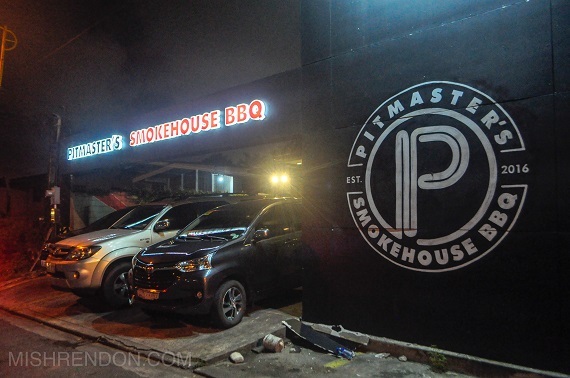 The Pitmaster's Smokehouse Bbq has been open to public since 2016. 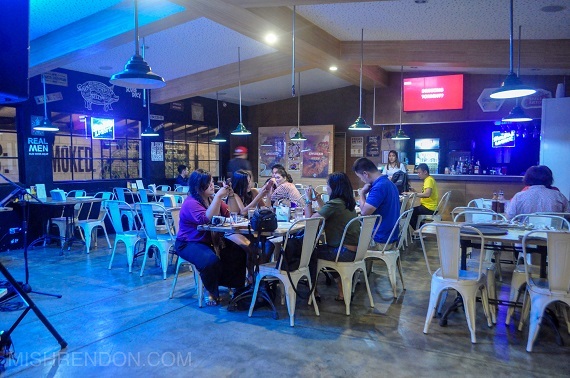 They're quite far from the rest of the restaurants in Kapitolyo but they're definitely a must visit. When it comes to their interiors, they have quite a spacious dining area. The tables and chairs didn't feel cramped or crowded at all. They also have outdoor seating area if you prefer such. At night, they usually have an artist entertaining the crowd. I feel like it's the perfect hangout place after work. The first dish that came out of the kitchen was nothing short of spectacular. Crispy oysters are smothered in garlic, mayonnaise, and aromat for that explosive flavor and texture. I love how crunchy the oysters are and the creamy sauce was a perfect match to it. It was a shame that I have to share this dish because I want to finish it on my own. One new addition to their menu is the Chili Sausage. Don't be fooled by the name because it wasn't that spicy at all. The sausages have that peppery flavor that I love and the sauce was mildly spicy. I am not really a fan of spicy food but I can easily tolerate this one. I had to order rice after this dish came out of the kitchen. There's no way you can have sisig without rice! The pulled pork had a good mix of pork meat and fat. It also has bacon so there's a sweet flavor you get to taste every now and then. It was sinfully good. 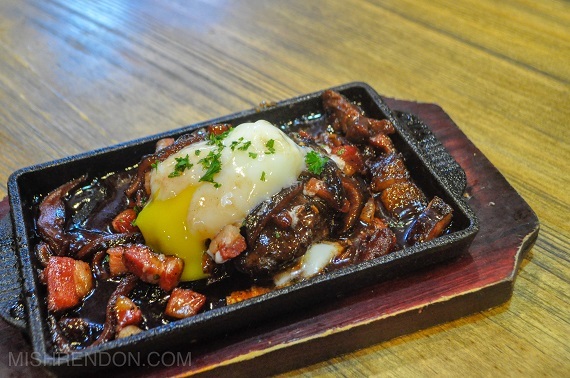 I found it kind of drenched in oil but isn't that how we want our sisig? 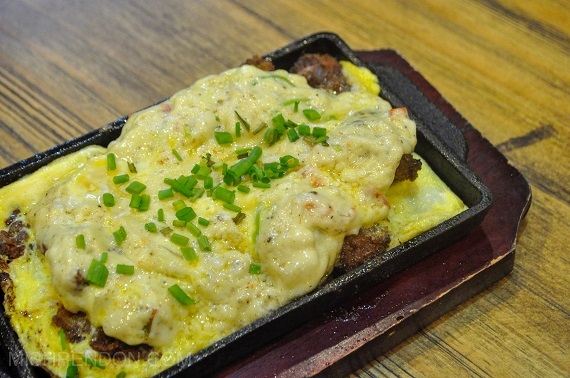 The Sizzling Burger Steak was a combination of sweet and savory flavors. The burger steak was of decent serving size. It was meaty good! The egg on top was cooked nicely although I'd love the yolk to be a little bit more runny. The sauce and bacon slices gave it a hint of sweet flavor. 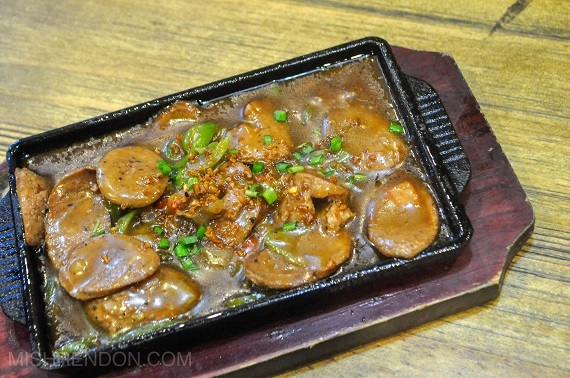 I also love how they added shiitake mushrooms to it cause it added a new taste to the dish. One of the underrated dishes that night was the Bacon and Mushroom Pizza (simply because everyone went gaga over the meats.) Anyway, this homemade pizza likewise has a sweet flavor to it and I think it's mainly because of their homemade bacon. I think this is something that kids will love. 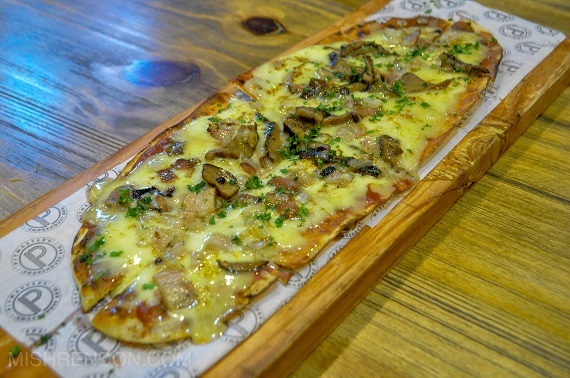 If you prefer something different from smoked meats, they likewise have tons of other dishes such as pizzas, sandwiches, soups, and salads. The highlight of the night was the Pit Platter. 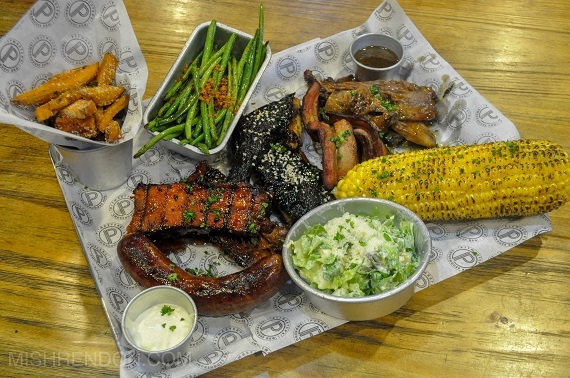 It is composed of the five smoked meats that Pitmaster's Smokehouse Bbq offers - the Pitmaster's Smoked Ribs, the Black Angus Brisket, the Smoked Bacon Strips, the Smoked Coriander Chicken, and the Pit Smoked Sausage. I personally love the beef brisket. This 15 hour smoked black angus beef brisket was extremely tender and tasty. It literally melts in your mouth. The seven hour smoked ribs were likewise fall-off-the-bone tender and very flavorful. The homemade seven day cured and smoked bacon strips were yummy but I think I was looking for that crisp. I wasn't a fan of the chicken also simply because it was kind of dry for my preference, but it has a really nice flavor. The Pit Platter also includes four regular sides of your choice and a carafe of iced tea. I personally prefer the corn cob (which you can have grated) and the garlic buttered french beans. They also have premium sides such as four cheese mac and cheese, truffle pasta, elote Mexican corn, among others, that would surely go well with your Pit Platter. Pitmaster's Smokehouse Bbq takes pride in their sauces. They currently have three variants which differs in sweetness and heat level. Apple is supposed to be the spiciest among the three. It wasn't as spicy as I expected and it has a runny texture. It actually has a sweet flavor. Hazelnut has a thicker texture and a tad sweeter than Apple. 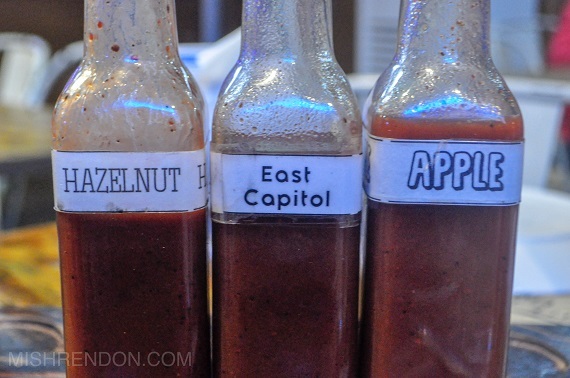 I think I prefer the East Capitol the most because it has a nice balance of heat and sweetness. 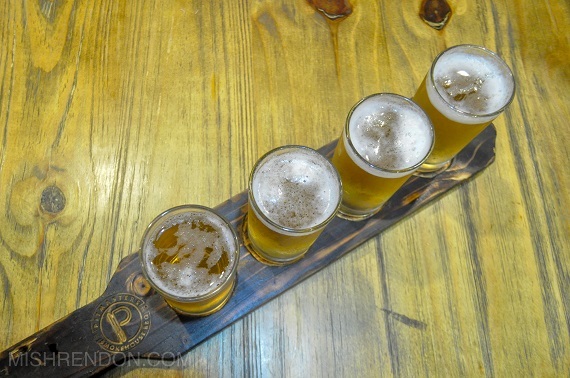 The Beer Paddle is a nice pair to Pitmaster's menu and good live music. We got a beer paddle which consists of four flavored beers - Brown Sugar Cinnamon, Salted Caramel, Hazelnut, and Banana. I was able to taste everything and I oddly found banana to be the best one. I thought I would like the Salted Caramel the best but it leaves a bitter aftertaste whereas the banana tastes smooth and sweet all throughout. 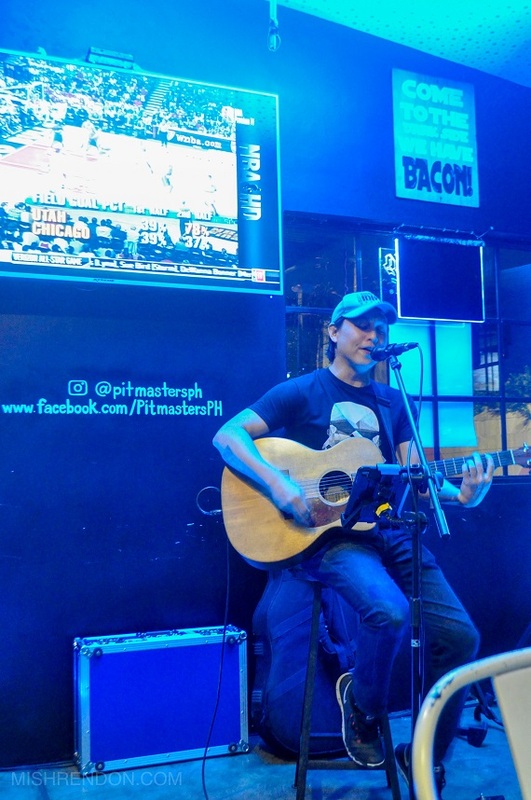 If you opt to have awesome food with good music along with great company, better visit Pitmaster's Smokehouse Bbq. 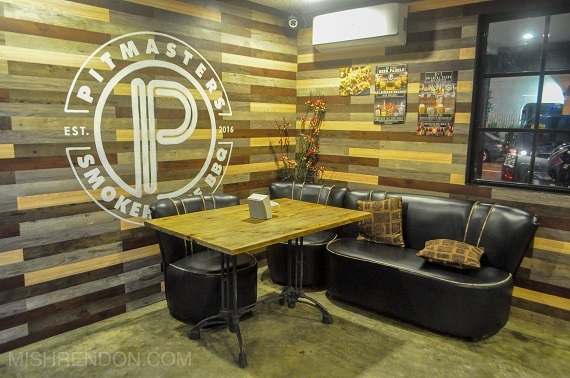 You may visit them at 64 East Capitol Drive, Kapitolyo, Pasig City.